Where does the dance begin, where does it end? Alright, here it is: The Fault in Our Stars is not only a very moving novel in which readers laugh, cry, and keep asking for more, but it’s also a narrative in which the characters actively confront and speak against traditional “disability tropes.” I’m completely aware that there has been (and still is) somewhat of a contentious relationship with the categories and experiences of “illness”/”disease” in relation to the category/identity of “disability.” Let’s just say that I know that… and I’m planning to leave that debate at the front door. While that discussion is hugely rich and can tease out a great number of nuanced experiences, I’m arguing for a *reading* of disability (i.e. reading through a disability “lens” or “framework”) of The Fault in Our Stars, both because I think such a reading will be hugely productive and because the characters themselves use words like “disability” to describe their experiences, so why not let them claim it? 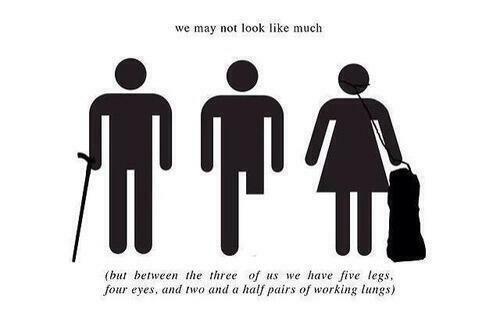 First, let’s start with Isaac, a faithful friend of both Augustus Waters and Hazel Grace. After the surgery that results in his blindness, he wryly tells Hazel, “people keep saying my other senses will improve to compensate, but CLEARLY NOT YET… Come over here so I can examine your face with my hands and see deeper into your soul than a sighted person ever could” (74). In not-so-many words, Isaac is critiquing the figure of the disabled “super-crip”—a person with a disability who has so far overcome their disability that they’ve surpassed both temporarily-able-bodied and disabled folks by developing something “extra special.” This is an unfortunate and problematic figure, because many people with disabilities do not, in fact, develop “extraordinary” abilities and are simply people.with.disabilities. full stop. My second favorite comes from good ol’ Gus who is so moved by the injustice of the persecution of the innocent at the Anne Frank House that he tells Hazel they should “team up and be this disabled vigilante duo roaring through the world, righting wrongs, defending the weak, protecting the endangered” (202). She indulges his fantasy, quipping,” our fearlessness shall be our secret weapon” (202). Again, though Hazel and Augustus don’t articulate it as such, they’re calling upon time-honored tropes of “disability as super-power” (think, for example of Professor X, Batgirl, Daredevil, the Hulk, etc.) and turning it on its head by continuing, “ when the robots [of the future] recall the human absurdities of sacrifice and compassion, they will remember us” (202). I’m not a conspiracy theorist (I don’t think?) but I do think that Hollywood has a very specific idea about what sells, which in turn creates very specific ideas in the minds of the generally able-bodied public about “the real” experience of disability. Why might the lines about Hazel and Augustus being disabled vigilantes be left out? Yes, it cleans up the dialogue a bit, but it also makes their portrayal as star-crossed teenage lovers more direct. If they aren’t articulating agency in their roles as cancer patient/amputee, then their passive acceptance of the tragically fated love is all the more palatable to audiences. If Isaac doesn’t make a snarky comment about his other senses making up for his blindness, then his character is much more easily read as a sympathetic one that requires the sympathy and charity of Augustus and Hazel. This isn’t the first time a Hollywood rendition of a novel has erased some of the most critical representation and articulation of disability (for another example, see Disability: Lost in the Translation of the Hunger Games), but it is a particularly unfortunate erasure because the very nature of the novel itself. Much like the nature of An Imperial Affliction that Hazel idolizes so much is wrapped up with the critical reflection of the main characters. By skipping these moments of critique and hyper-awareness of the ways in which disability is often represented in popular culture, Hollywood is not doing the general public (disabled and non-disabled alike) any favors. Green, J. (2012). The Fault in Our Stars. New York, NY: Penguin Books. RoboCop 2014 — A Life Not Worth Living? Reading “The Clocks” Possible Subtitle: “Those Blind Devils”?